Now that the wedding is over, and I’m getting back into the swing of things, I wanted to share my experience of managing type 1 diabetes while being a bride. I have a Dexcom G4 Continuous Glucose Monitor (CGM) and an OmniPod Insulin Pump. My CGM sensor was on my front right side thigh. My OmniPod was on my lower back — approximately where “www” reads in the above photo. Neither showed through my wedding dress, and that was a big reason why I bought this particular dress. I DID NOT want to be without my Dexcom or insulin pump on my Wedding Day. Much earlier, I had told our maitre d’ that I had diabetes, and he assured me that he would make sure that I ate throughout our wedding day. I arrived at 10:00am at the reception hall to get my hair, makeup and dressed for the big day. I was provided with a breakfast sandwich while doing my hair. My blood sugars were slightly high (in the 180 mg/dL range), but I wanted them higher to avoid an unpredicted low. My worst fear was falling over or passing out due to low blood sugar on my Wedding Day. 3:00pm came mighty fast! Next thing I remember was being told that it was time to put my dress on, get photos with our immediate family, and have a “first look” with my groom! I was unsuspectingly calm during this process, but extremely excited. We took multiple photos with all of our different family members, and I could see that guests were beginning to arrive. My nervousness started to set in, and my blood sugars started to drop. The groom could see it in my face, and he asked the maitre d’ for a glass of orange juice. I chugged down that glass of juice faster then you could image, and drank another one “just in case.” Then I fixed my makeup, and prepared myself (and the bridal party) to walk down the aisle. I stood there waiting to hear “here comes the bride” and somehow I remained calm. It wasn’t until my dad and grandpa grabbed my arms that I started to feel the overwhelming sensation that this was really about to happen. I took a deep breath and reminded myself that I was getting married to the man of my dreams. All my planning had led up to this very moment! I tucked my dexcom cgm into the top of my dress and walked down the aisle. The ceremony went by very quickly, but my blood sugars remained normal. At 7:30pm on August 8, 2014, we were pronounced husband and wife. Everyone was escorted into the room for cocktail hour. My husband and I, and our bridal party, went outside to take photos on the beach. It seemed like that took forever, and I kept telling the photographer that I needed to leave and go into the cocktail hour. I needed to eat, and I could feel my dexcom vibrating on my cleavage. I chugged some orange juice again, and prepared to be announced as the new “Mr. and Mrs. Michalski” to all of our wedding attendees. I had a constant smile on my face. We had our first dance. We heard some speeches. We did the champagne toast. He had his mother/daughter dance. I had my funny father/daughter dance. We enjoyed every minute of the night that was quickly passing us by. Dinner was not served until 11:00pm. All of the guests were too full to eat anymore, but my husband and I were starving. I was served an extra potato because the maitre d’ knew I needed carbs to hold me over. I was burning up so much energy and it was hard to keep my blood sugar up between dancing around, taking photos, drinking, sweating from the millions of layers below my dress, and not being able to actually eat anything sustainable! Our wedding cake was especially made for me. It was covered in Calla Lilies, what I am named after. The top layer was made with Splenda, just so I could be sure I could eat my own Wedding Cake. The frosting, or as I’ve learned that it is actually called fondant, was not sugar free. When we were ready to eat cake, I could really care less if I ate sugar free or regular cake. There was a lot of other things going on, and I was fighting low blood sugars for most of the night. If I got a little high, I didn’t mind. That however, was not the case. The cake made me have normal blood sugar levels, and I later found out, that it was not part of the sugar free cake. I felt lucky, and so happy that I didn’t pass out on the dance floor! 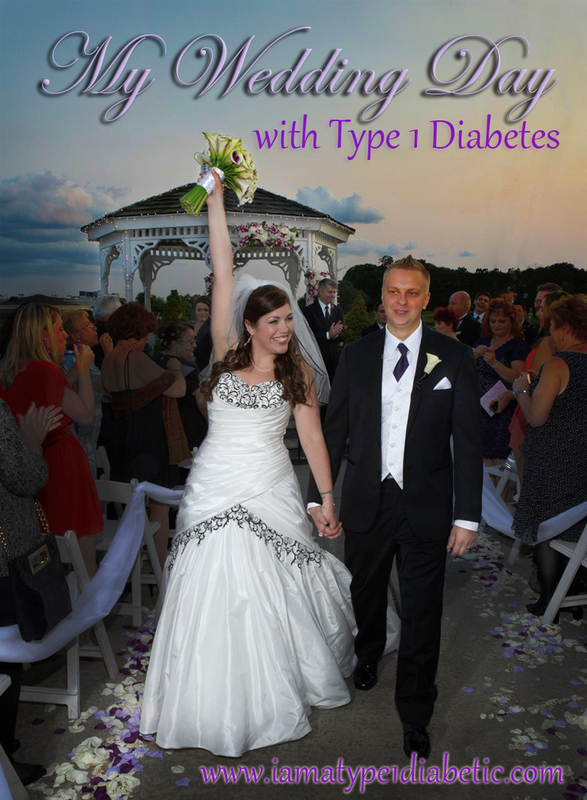 I am happy to share my experiences as a type 1 diabetic and a bride to all of those who may someday be in my situation. The night ended way to fast, and before I knew it, I was whisked away to my hotel room. I enjoyed every moment of our Wedding Day — and tried to cherish all the moments I possibly could. Thanks again to everyone who has wished us a “Congratulations,” and those who have granted us with gifts. We really appreciate everything that was done to make our day so special. I am so proud of you for your beautiful story to share and all you have done to help so many, especially the younger ones, living with diabetes. Congratulations Mrs. Michalski!